Samuel’s opening notes of ‘Jesus Maria’ emit a tone of skewed warmth, imperfect but aglow. What follows is an almost heartbreaking conversation between Blaser, Russ Lossing whose piano notes fall as clear spring raindrops, and the ghostly double bass of Drew Gress. Gerald Cleaver locks into this sensitivity brushing drums or rustling cymbals and I drifted into a meditation that I didn’t want to leave. It’s a gorgeous piece written by Carla Bley and was featured on the Jimmy Giuffre 3‘s album Fusion, 1961. Spring Rain is a tribute to Giuffre, specifically his now-revered, explorative work with Paul Bley and Steve Swallow and combines covers with original compositions in a conducive listen. Lossing makes the difference in ‘Missing Mark Suetterlyn’: as Blaser trills and sways with a wonderful, inebriated tone, Russ brings the double joy of piano and keyboards (he plays Minimoog, Fender Rhodes and Wurlitzer on this album). His electronic runs and chord stabs funk it up, space it out and take us into a thrilling, lawless landscape. All the time Cleaver is finding off-beats with laudable subtlety; he’s finely integrated but always notable. This track leads straight into the lucid melody of ‘Temporarily’ (another Carla Bley composition). There’s a sense of the recognisable here, like a warm ’60s jazz homecoming. 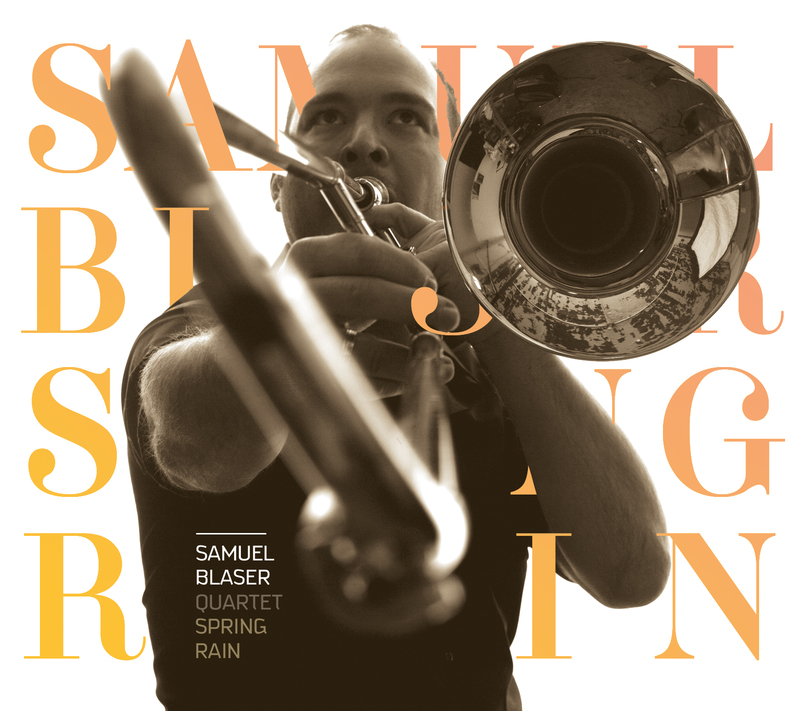 Blaser hits the spot in the way a trumpet can – with soulful, cool sensibilities. Spring Rain has been directed by Robert Sadin, a classical conductor (a vital point as there are flavours of classical expressionism in Blaser’s playing) who also arranged and produced output such as Gershwin’s World by Herbie Hancock. From the musical themes to the sequencing, this feels a quality production. I adored Blaser’s short solo ‘Homage’, its romantic grief like a modernist ‘Last Post’. If it was played with Blaser’s late manager, Izumi Uchida in mind, I can’t think of a more touching goodbye. ‘The First Snow’ is a free-for-all improv that again shows how this quartet is greater than the sum of its parts. They entangle themselves yet create space for ideas to breathe a fresh air. If I’m honest I don’t find the trombone an easy listen, but the combination, especially with Lossing’s exquisite electronic touches, creates both an engaging tension and harmony. Blaser says, “I want people to know that there is jazz, blues, classical music, beautiful melodies and no boundaries,” and maybe that’s why I like this album. However I also think taking Guiffre as inspiration has given Blaser permission to incorporate five interpretative covers as well as provide a fertile direction for composing. The Giuffre 3 are now recognised for their crucial contribution to free jazz, but disbanded in 1962 after the avant-garde album Free Fall and a gig where they earned 35 cents each. I’m certain there are quite a few musicians out there now who can relate to that. Spring Rain will tour in November and December 2015. I met Andreas Schaerer two years ago almost to the day, when he was on a week-long course for jazz musicians in the UK. It was about 10pm and he was the last of seven interviews I was doing, we were both pretty exhausted. There’s a softness to people zapped of the energy to be nervous or erect the usual social barriers. The room was lit only by the evening sky outside and Andreas was slumped forward, his head rested in his hands. “I’m a bit f***ed up,” he said. Lack of planning and things going better than expected meant everything was coming at him at the same time, “Too much work, pressure and expectations,” he explained. In a way he didn’t need to tell me. When I’d checked his website for my research I could see this was a man who liked to say, ‘Yes’ and play ball with everyone who asked. He wasn’t shy of taking responsibility, but that evening it felt like there was a truly heavy weight on his shoulders. On May 28th of this year, Andreas will be walking up the ‘red carpet’ of the ECHO Jazz Awards to collect International Vocalist of the Year, a prize won by Gregory Porter in 2014. This is massive, not only for Andreas, but dare I say, for Switzerland. Another building block increasing the country’s reputation for distinctive music of quality. It was just as well Schaerer didn’t take my advice to slim down his commitments! Instead he developed bigger muscles to face the challenges, releasing four albums in just over a year. Admirably he also scheduled in time for a proper long holiday with his young family. As I write this, Andreas is at home in Bern surrounded by sheets of scores he’s composing for his band Hildegard Lernt Fliegen and the Lucerne Festival Orchestra, no less. That’s music for almost 70 musicians from two harps to eighteen violins and a tuba. “There’ll be some Beatboxing meets classical percussion meets three marimbas,” he told me, “there’ll be fairytale-ish harmonic moments and lots of madness….” That sounds about right. It will be a prestigious, one-off concert in Lucerne on September 5th and I can’t wait. I know it’s not a Swiss characteristic to ‘blow your own trumpet’ (shout about yourselves) so I like to do it for you. 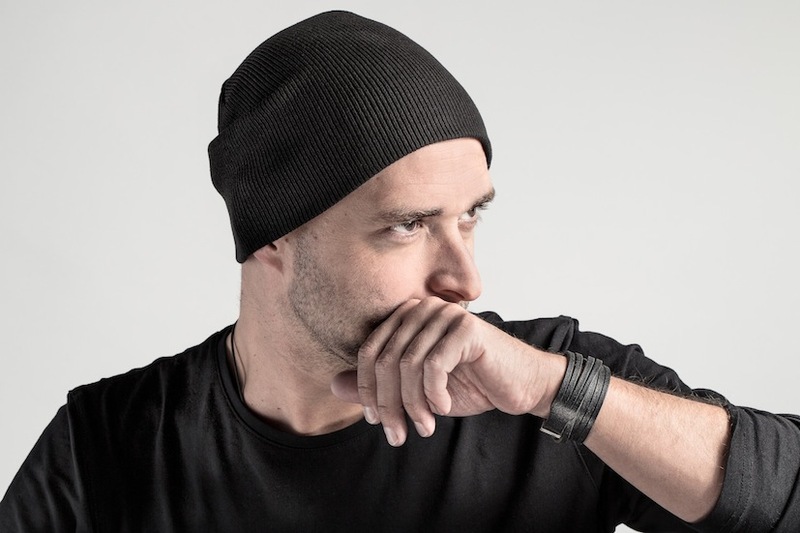 Along with the ECHO Award, Schaerer was nominated for the Swiss Music Prize and voted International Newcomer of 2014 by French magazine, JazzMan. Hildegard Lernt Fliegen won the BMW World Jazz Award – both the jury and the audience prizes (!) and their album, The Fundamental Rhythm Of Unpolished Brains was voted as Best Vocal Release of 2014 by New York City Jazz Record. The album Arcanum with Lucas Niggli won the Deutscher Schallplattenpreis and was chosen as a ‘CHOC’ by JazzMan Magazine in 2014. So not a bad year then. And one that clarifies the importance of originality and drive in a highly competitive and crowded market. I think it helps that Schaerer can have an audience giggling whatever their language, we all need a laugh every so often. Vein are building their career, brick by brick. Jazz Talks is Vein’s ninth album and features legendary American saxophonist, Dave Liebman. His career includes stints with Miles Davis and Chick Corea – a tangible link to the heritage of jazz of which Vein are clearly so passionate when you hear ‘Walking With a Start’ or ‘Black Tortoise’. Live, Michael ripples with influences from Stravinsky to Bill Evans, but Vein are so steeped in the jazz tradition that they are able to weave in their own voices. Not an overnight achievement. “I think it’s more honest to find something personal and stay with it,” says Michael when we discuss their music style. For me, there is almost a telepathy between Michael and Florian onstage but Thomas is an equal member of the crew. “Vein is a collective and this is an important philosophy of the trio…We try to develop to find more possibilities and more freedom on how to play together on an equal level.” The band are always looking for how they can break the traditional roles of a piano trio and be truly multi-dimensional. When I ask what he wants to work on he replies, “Everything…I don’t like to relax and think, ‘Oh now I can do what I want,’ this is dangerous for music. I like to go on and improve everything: to compose better, play better and have more to say – that’s the most difficult”. Vein will be one of the four Swiss acts that Swiss Vibes is presenting at Montreux Jazz Festival (Château de Chillon) ont the 10th of July. Be there!